If you pay attention to the news, you’ll find daily stories about yet another person who has had their identity stolen because their hard drive has fallen into the wrong hands. They have sold their computer on eBay or Craigslist or they have given it to a charity and their information has gone with it. The popular thought is that formatting the hard drive or reloading the operating system will irreversibly destroy all of your private information but it won’t. 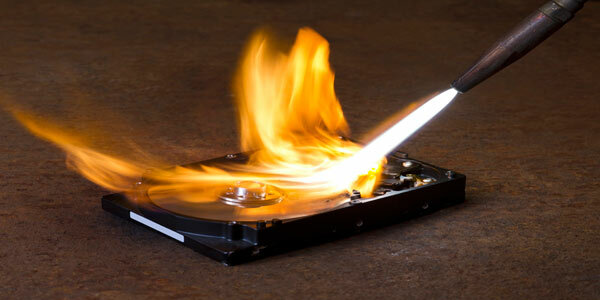 Our data recovery services can get it back for you if you goofed and want it back. Unfortunately, criminals have similar tools available to them and they can get it back as well…but for themselves. 1.If your drive operates properly, we will use data destruction software to write ones over the entire surface of the hard drive in the first of 2 passes. The software will then write zeros over the entire surface of the hard drive in the second pass. This effectively makes the hard drive blank and makes the data totally unrecoverable. 2.If your drive doesn’t operate properly, we will physically destroy the drive by putting numerous holes through the drive as well as causing other catastrophic damage. Once your data is gone, we either return the drive to you or, if you prefer, we will deliver it to a recycling facility for proper disposal.